Enter this month's Where on Earth? contest here! 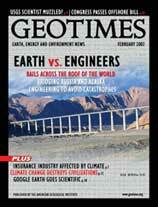 Go to Geotimes' Web Extras Archive for past online news coverage. Read more Travels in Geology in the Geotimes' archive. Are you concerned about your insurance costs rising as the climate changes? In July 2006, the railroad linking China and Tibet opened for business, in what is likely to be one of the greatest geotechnical engineering achievements of the 21st century. Preventing loss from the failure of structures and resisting the impact of geological processes is of paramount importance to public safety. To help prevent such losses, engineering geologists and geological engineers investigate sites for geological hazards prior to development. Building a bridge across the Bering Strait might seem fanciful, but the technology to create it is sound — and the bridge has some practical applications, such as transporting natural resources from Russia to North America. Water responsible for martian landscape? Shifting winds shift warming trends? Scientists and nonscientists alike are increasingly utilizing the user-friendly Google Earth to connect and share data with each other and to watch the planet in motion. Geoscientific research is quite important in the insurance industry’s catastrophe risk models, and is growing ever more important as the climate changes. What you don’t know about geology could kill you — spread the word before the diseases spread. Books: Mark Twain’s “Lost Cement Mine” no longer lost? 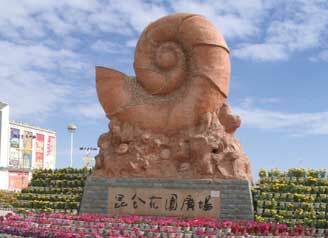 The Qinghai-Tibet Railway boasts more than 450 bridges as it crosses three major mountain chains and five rivers. The Sanchahe Bridge, pictured, is the tallest bridge on the railway at 54.1 meters.